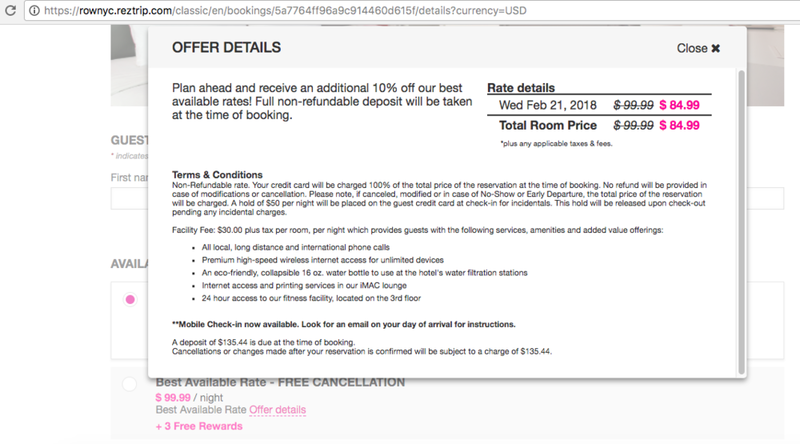 Why Are NYC Hotels Lying About Providing Internet Services With Amenity Fees (aka Resort Fees)? It is illegal in New York to tax internet services at hotels. This is due to the Internet Tax Freedom Act. 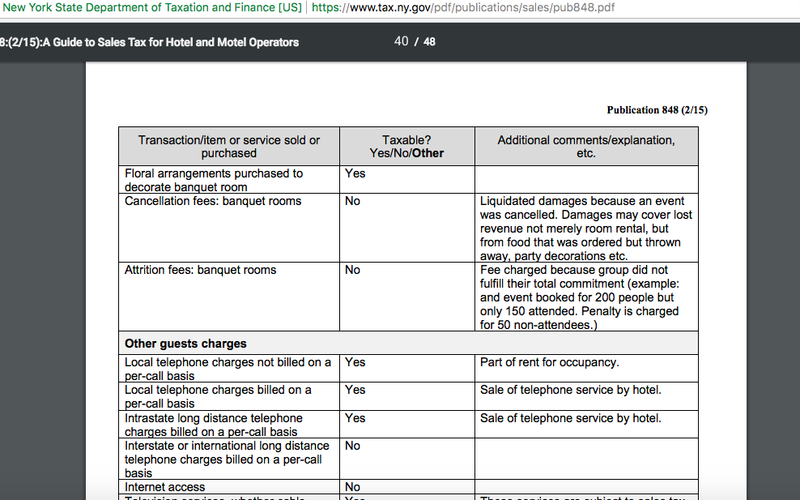 New York makes this very clear in their information to hotel operators on how to tax various services provided at a hotel. Despite not being allowed to tax internet services at New York hotels, most hotels charging a resort fee / amenity fee / destination charge / urban fee in New York City are violating NY tax law. A resort fee is a way for the hotel to lie about the price of a room. You are paying a hidden second room rate when you pay a resort fee. As you can see in the tax policies above, you sure are not paying for internet access if it is being taxed at hotel occupancy tax or NYC sales tax. Resort fees are fairly new at most NYC hotels. The number of hotels charging deceptive and misleading hotel resort fees in New York City went from 15 hotels in July 2016 to 42 hotels in July 2017 to currently 72 hotels with resort fees in January of 2018. Clearly these hotels feel no legal or moral obligation on how to advertise or tax services are provided by the deceptive resort fee / amenity fee. Below are a variety of examples of hotels claiming to provide internet access with their resort fee / amenity fee / urban fee / amenity fee / tourist scam fee. The New York Hilton Midtown says their $25 "urban destination charge" provides "premium guest internet access." The Hilton Midtown currently taxes their "urban destination charge" at NYC hotel occupancy tax at 14.75%. So legally you are paying a for a hidden second room rate, not internet services. The Grand Hyatt in New York City says their misleading $25 destination fee provides "high speed premium internet." The Grand Hyatt is currently not taxing their destination fee (aka resort fee) according to two phone calls to the hotel booking department made on February 4, 2018. This means the hotel could be providing you internet with the destination fee but it would be quite illegal to provide other services for the destination fee and not tax them. Also, as we have said before, New York City is already losing millions due to the hotel resort fee scam. This is just another example of a hotel contributing to massive tax revenue loss in New York City. The New York Marriott Marquis says their $25 destination fee provides "enhanced internet." The NY Marriott Marquis is currently taxing their resort fee at NYC hotel occupancy tax (14.75%). So when you pay their daily destination fee, you are paying for second hotel room rate, not for internet service. The Row NYC says their $30 facility fee covers "high-seed wireless internet access for unlimited devices." The Row taxes their facility fee (aka resort fee) at NYC sales tax of 8.875%. This means the city is losing the difference between the hotel occupancy tax and sales tax (5.875%) on each room in the hotel with the facility fee per night. Aside from that, it is illegal for the hotel to say they are providing internet services when they tax those services sales tax. As you can clearly see from the guidance from the state above, hotel internet services cannot be taxed. Want to read the full New York Department of Taxation and Finance publication on taxing services at hotels and motels please visit this site: https://www.tax.ny.gov/pdf/publications/sales/pub848.pdf Make sure to check out page 41.